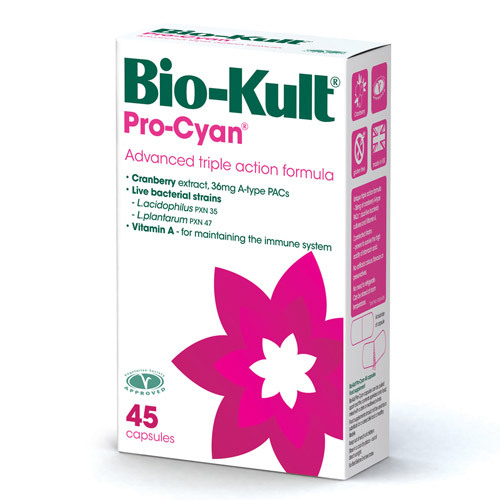 Bio-Kult Pro-Cyan is a triple action formula with cranberry extract, two selected probiotic strains and Vitamin A that work with your body to help maintain normal levels of bacteria in the gut in order to help maintain a healthy urinary tract. Lifestyle changes, stress, medicines and disease can sometimes deplete our beneficial gut bacteria, allowing E.coli to become established and cause infections. These infections can damage mucous membranes which line the urinary tract. 500 million probiotic microorganisms (>5 x 108 CFU/capsule), equivalent to 2.7 billion probiotic microorganisms per gram (>2.7 x 109 CFU/gram). Concentration of 500 million probiotic microorganisms per capsule is guaranteed throughout the shelf life. Cranberry Extract (Vaccinium macrocarpon), Cellulose (bulking agent), Probiotic Strains (see above), Vegetable Capsule, (hypromellose). Adults: Take 1-2 capsules once or twice daily with food. 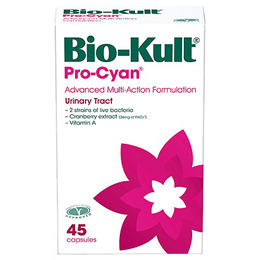 Below are reviews of Bio-Kult Pro-Cyan Healthy Urinary Tract - 45 Capsules by bodykind customers. If you have tried this product we'd love to hear what you think so please leave a review. Good probiotic supplement. I think it probably helps with bladder health,there is a very interesting article on the Bio-Kult website explaining how it should support the urinary system. Body kind are just perfect.